Martinha was originally held at CRAM-Q, a wildlife rehabilitation centre near the town of Quiaios, in Portugal. That facility built a tank in their backyard, specifically for Martinha. 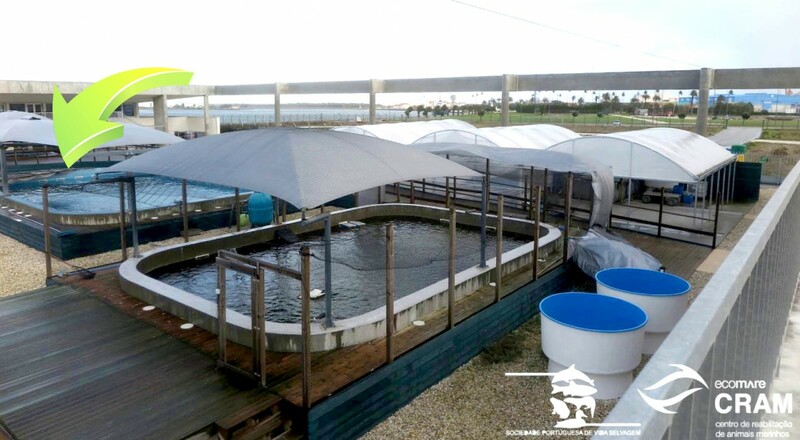 When experts from the Martinha Rescue coalition visited the rehabilitation centre, they were horrified at the small size and 'swimming pool' like nature of the tank. It was as if CRAM-Q was keeping Martinha as a private pet. In evidence at the site was the poor water quality (visible as a distinctive green colour due to the high algae concentration). Additionally, the pumps were positioned extremely close to Martinha's tank. When they were running they were clearly audible from 30m away. An above-ground plastic swimming pool was located alongside Martinha's tank. Its purpose was unclear, but it may have been a highly inappropriate 'medical' pool. We know that Martinha was held in this tank until at least mid July 2016. To estimate the size of the tank in which Martinha was held, we found the CRAM-Q facility on Google Earth and used their 'measure tool'. The dimensions were 13m x 7m (and we estimated the depth to be less than 2m deep based on the photo showing CRAM-Q staff standing in the tank). The surface area of this backyard tank would be less than 91m2, as the corners are rounded. These dimensions are listed (green row) in the table on this page, so they can be compared to the other tank measurements (blue rows) from the facility where Martinha may now be held. 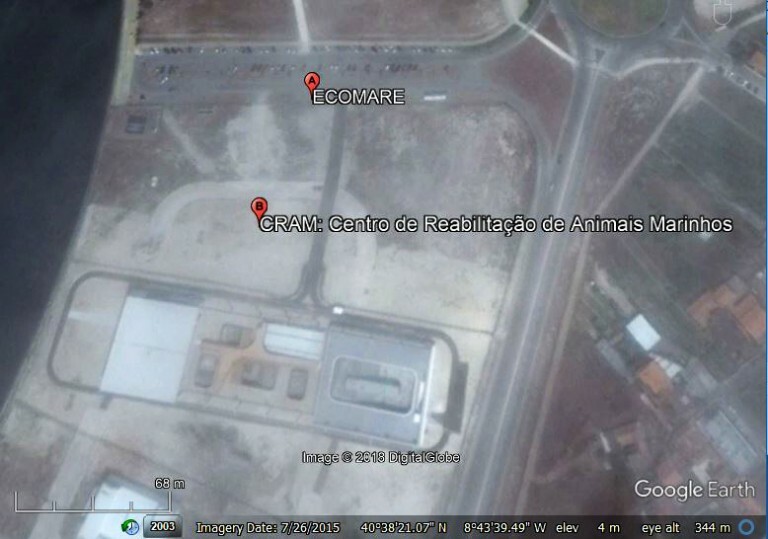 So, we did some research online and found a site labelled as ECOMARE and right next to it, CRAM: Centro de Reabilitação de Animais Marinhos. 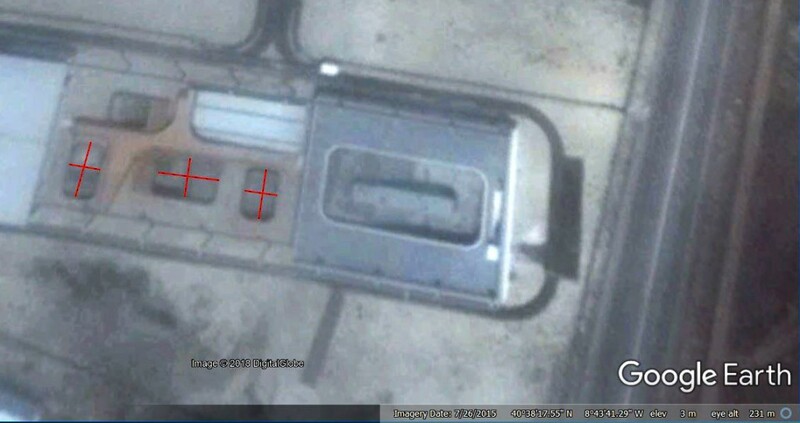 A screen-grab from Google Earth, of the facility still under construction, is shown here. You will note that the tanks have no water and that the date of this image is 26 July 2015, a year before the letter above. Following that CRAM-Q and SPVS letter, we received one from the Portuguese Government. It would appear that, half a year later, Martinha had still not been transferred. The description for her improved conditions is nearly verbatim from the letter sent to our coalition in 2016. But in the meantime, where was Martinha? According to ICNF, she was 'at the new rehabilitation center' (although it isn't clear exactly when she was transferred, it likely occurred between 21 August 2016 and 13 Feb 2017). Once there, into which tank would she have been placed ? 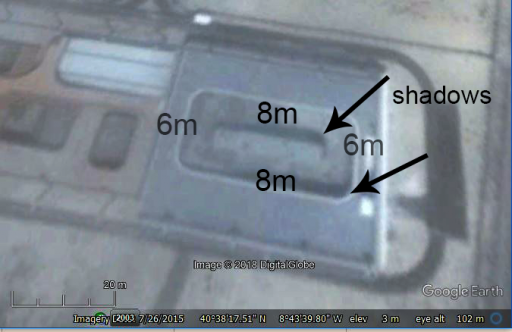 Again, relying on the limited information supplied to us, ICNF has stated that she wasn't yet in the '800m' tank, so that left four possible tanks visible in the satellite imagery. The northern tank is unlikely (it is the smallest and is a square shape and can be seen to the left of centre in the panorama below) - so we immediately ruled that one out. Online photographs, posted by CRAM and others, do show three tanks clustered together and filled with water by May 2017. Two of those (the centre and eastern) have shade installed. In the panorama image below there are three umbrellas over the right-hand tanks. 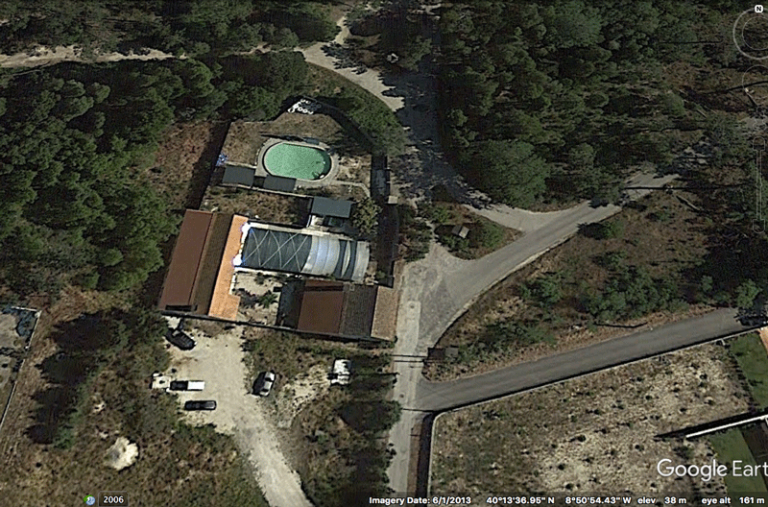 Again, using Google Earth we measured the tanks and found that these three are barely larger than the backyard tank that Martinha was held in at CRAM-Q (blue rows in the table below). The largest tank (centre) is approximately 15m x 10m. 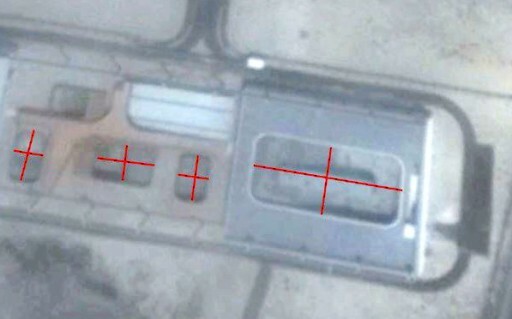 The satellite imagery strongly suggests that theses tanks are not interconnected and the photos online show different water colour between them (also suggesting they are not interconnected). Therefore, we believe that Martinha was restricted to just one of these tanks. 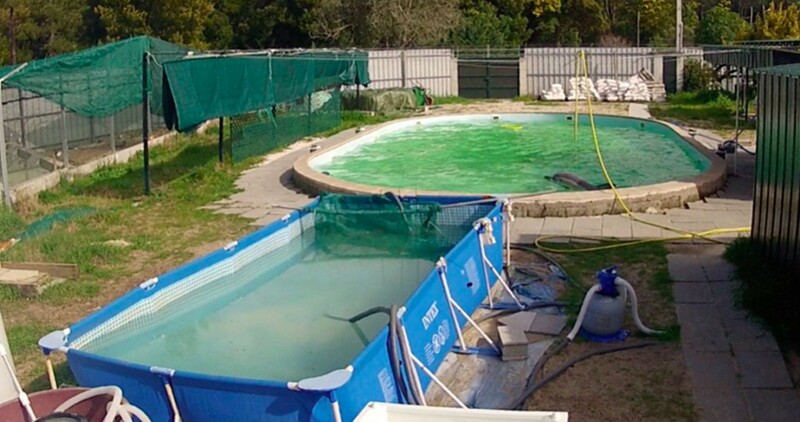 The size differences, between Martinha's backyard 'swimming pool' and the 'new' tanks show that the even the largest of the three (the centre one) is only 2m longer and 3m wider - and although an improvement, hardly sufficient for a dolphin to 'thrive' in and certainly not sufficient for her to perform natural behaviours. We have no indication in writing as to how deep these tanks are, but basic forensic assessment of the shadows suggests that they are shallower than the single rectangular tank off to the east of this cluster of three. That single tank is likely 5m deep, based on the information supplied by CRAM-Q, SPVS and ICNF. HOW BIG IS 800m2 ? In the letters we were sent by CRAM-Q, SPVS & ICNF they failed to give the length and width of the tank to which Martinha would be moved. Rather, they chose to use surface area, stating that the tank would have a surface area of 800m2. Some basic mathematics, however, suggest that the likely dimensions for this surface area are 20m x 40m. When measuring (on Google Earth) the single rectangular tank to the east of the cluster of three tanks, we found that, indeed, this tank measured 20m x 40m. Could this be Martinha's current tank? 5m DEEP + AN ISLAND? If this is indeed Martinha's new tank (we emphasise that we have received no evidence that it is), then the size difference between her 'backyard bathtub' and this is significant and as such, we commend CRAM and SPVS for providing her with this larger enclosure. Additionally, the information we have so far indicates that the new tank for Martinha would be 5m deep (compared to the backyard tank which was less than 2m). CRAM-Q gave a surface area (800m2), but no dimensions for this new tank. Could it be that this was because the dimensions would have been difficult to explain? 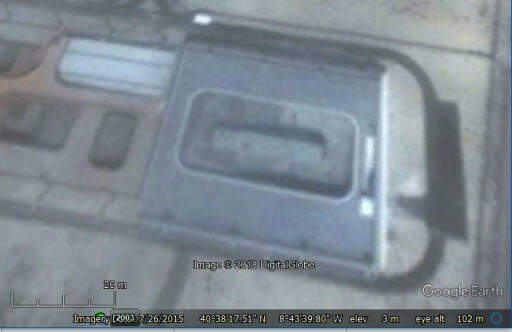 If you look at the satellite image there is possibly some sort of a structure in the middle of the unfilled tank. Could that be an 'island'? Again, we did some measurements on Google Earth. It appears that the possible 'island' is approximately 25m x 5m (or 125m2 in surface area). It is evenly spaced from the tank walls; 8m from the north and south walls, 6m from the west and east walls, suggesting that it is placed purposefully and is not temporary construction material. Looking at the shadows 'inside' the tank, it appears as if the southern wall shadow and the 'island' shadow are similar in length, suggesting that they are of a similar height. This would mean that Martinha does not have the full use of the tank, as she can't swim across the middle due to this possible 'island' and in effect, she has a tank with a significant swimming impediment in the middle. It is unclear from this satellite imagery what such an 'island' might be used for and we could find no photos of this tank or area of CRAM online. The shadows indicated in the photo also suggest that the tank is shallow to the west with a ‘drop-off’ zone, where the shadow changes shape as it descends to the east. 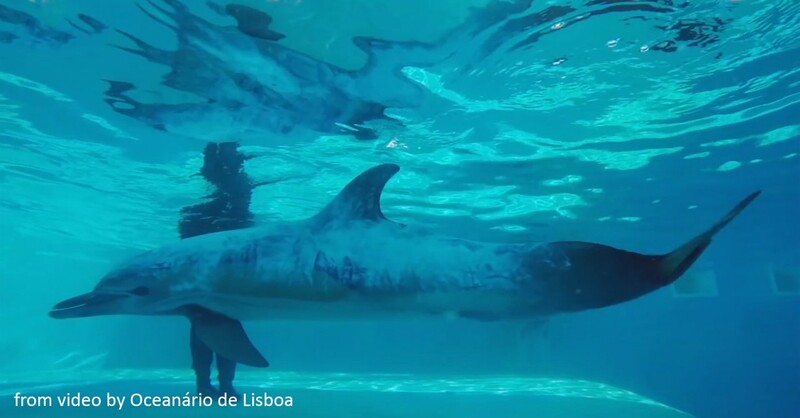 On 27 April 2017 Oceanario de Lisboa posted a VIDEO which is supposed to be a showcase of the CRAM centre. 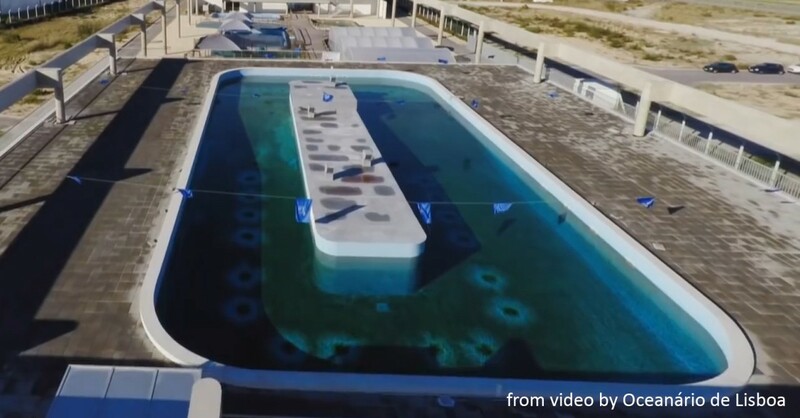 Tellingly, the tank that we have speculated is likely to be Martinha’s tank, although filled with water, has no dolphin visible (and we have checked frame by frame). The ‘island’ that we were uncertain of in the Google Earth images from 2015, is now very obvious and is indeed a concrete obstruction in the center of the tank. There appears to be no passage through or under the ‘island’ as there are solid walls visible in the video. There are clearly vents protruding from the surface area of this ‘island’. Could these be vents for the water filtration system? If so, then the noise in the tank must be obnoxious to any animal held in there. Certainly, if this is the same “800m2 surface tank” that the CRAM and ICNF have claimed, then their calculations seem to be wrong and this tank has less than 800m2 and the surface area is severely obstructed. Additionally, ICNF stated that the new CRAM facility, Martinha would have access to “naturalized housing conditions”. However, in the fly-over drone and underwater video we can see nothing that remotely resembles such a habitat, rather the tank is nothing more than barren concrete. That same video also shows people carrying a dolphin in a stretcher, presumably into the facility. It also has underwater footage of a Delphinus dolphin, that might be Martinha, covered in a cream. There is a person standing next to the dolphin and the water is about waist deep. There is a ‘drop off’ towards deeper water to the right of the dolphin and in the walls, what appears to be underwater viewing windows. If this is indeed the same tank that CRAM & ICNF have claimed Martinha has been moved to, it certainly does not have “5 meter depth” over the entire tank, as they have alluded to. The shadows from the construction photos and the stills from this video indicate that at least a third of the tank is shallow (less than 1.5 m deep) and a third is the ‘drop off’, with the last third at an unknown depth, but perhaps 5 meters deep. So, it would be logical to ask why CRAM and ICNF have continued to mislead us about the situation with Martinha. So, once again, we are left with no transparency about Martinha's whereabouts or her welfare and we hope that you can help us find this information. MOVED AROUND FROM TANK TO TANK? On 2 February 2018 CRAM-ECOMARE posted an image to their facebook page in which two of the small pools are visible. A shadow can be seen in the centre tank, could this be Martinha? 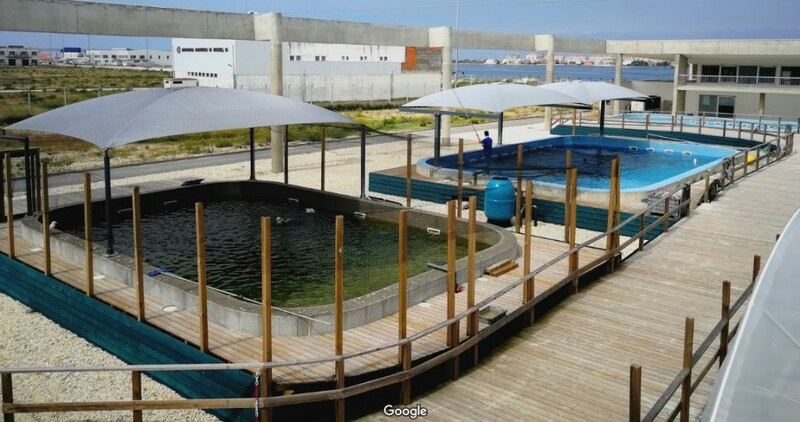 Although we don’t know when this photo was taken, it was stated in the Portuguese Environment Ministers Office report of January 2019, that Martinha is kept in a smaller pool during December and January. Learning that Martinha may often be moved around from tank to tank is a cause for concern.